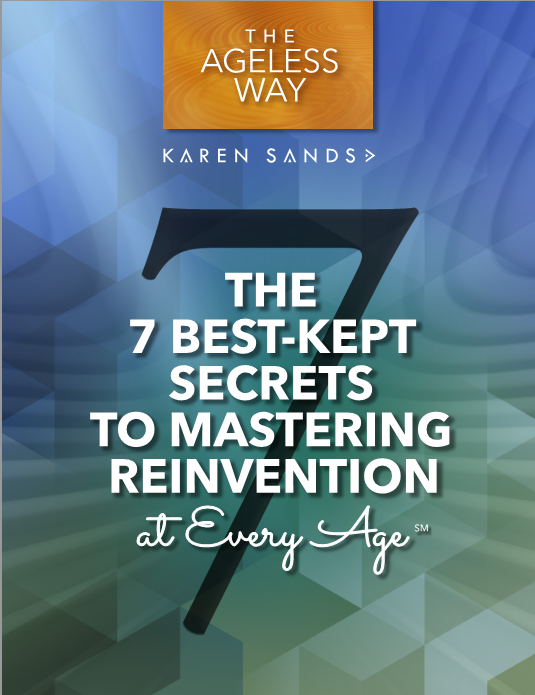 In addition to the free report, if you chose to also receive a complimentary subscription to my Ageless Beat newsletter and blog, you will soon receive the next issue, with strategies, tips, stories, and advice on how to make your future rock, and how to Rock Your Age! For forty plus years, I have mentored accomplished women and men, audacious, conscious entrepreneurs, enlightened leaders, world shakers, and change makers to greater futures, and I am now available to answer your concerns in my newsletter and blog. To ensure that you receive my future messages, an email has been sent to your email address to confirm your information. Please follow the instructions in the confirmation email to verify that your contact information is correct. It’s very easy and quick. We do this extra step (called double or confirm opt-in) to protect your private email address and to stop any abuse that could happen. Your email should arrive very soon. The confirmation email will come from Karen@KarenSands.com Just open it and click on the link to confirm your address. That’s all there is to it. The whole process should take only a few moments. I look forward to rocking your age together!